For Chris Hill, CEO of WeWork Japan, the day begins at 5:00 a.m. with meditating in the bath. “I’m a routine-oriented person,” he said in an interview with The Japan Times at the Iceberg, WeWork’s iconic seven-story, glass-clad coworking space located near the nexus of Harajuku and Omotesando on Meiji-dori avenue. “I really try to look as far out as I can into the development of this region; I’m looking at 18 to 24 months ahead, visualizing scale … staff … cities … and trying to get a full picture of what Japan really looks like. I then kind of pull it back to what’s happening. So I start really far out and pull it back to the day,” Hill said. Hill, whose career with parent company WeWork Cos., a U.S. coworking space startup backed by SoftBank Group Corp. and the world’s largest provider of shared office spaces began shortly after it commenced in 2010, is a fan of routine. Citing his mother’s upbringing as a Navy child as rather influential regarding the way he was raised, Hill is in his comfort zone when things “are in order” to the point where meetings with Tokyo’s leadership team are precisely timed. “We meet every Monday morning for exactly 90 minutes. It’s an opportunity to cross-functionally connect, ask questions and post information updates,” he said. A newcomer to this country — “Japan was always on my list of places to come visit, but I never anticipated winding up here running this specific region” — the New Yorker, who arrived in late 2017, admits to this country’s sense of being in the moment and people’s professional commitment to their job, no matter what their role is, have already profoundly affected him. “When I return to New York now I get a little anxious … getting into a taxi cab … is quite a different experience,” he said with a laugh. Settling into his role and describing himself as someone who leads from the bottom and places himself below his team on organizational charts, Hill is not the first to admit that the timing of WeWork’s entry into the Japanese market has been fortuitous. Helping to redefine work culture in Japan, the firm has opened seven offices in Tokyo and one in Yokohama within nine months, with plans for Osaka, Fukuoka and another Tokyo location, Nogizaka in Minato Ward, slated as future headquarters. “What’s really driving our success is that we’re aligned with initiatives that Prime Minister (Shinzo) Abe and the Tokyo governor are both very passionate about. All of us — WeWork, Prime Minister Abe and Governor (Yuriko) Koike — are changing the way the Japan workforce actually comes to work on a daily basis. It’s been a huge help for us to be aligned with that,” Hill said. 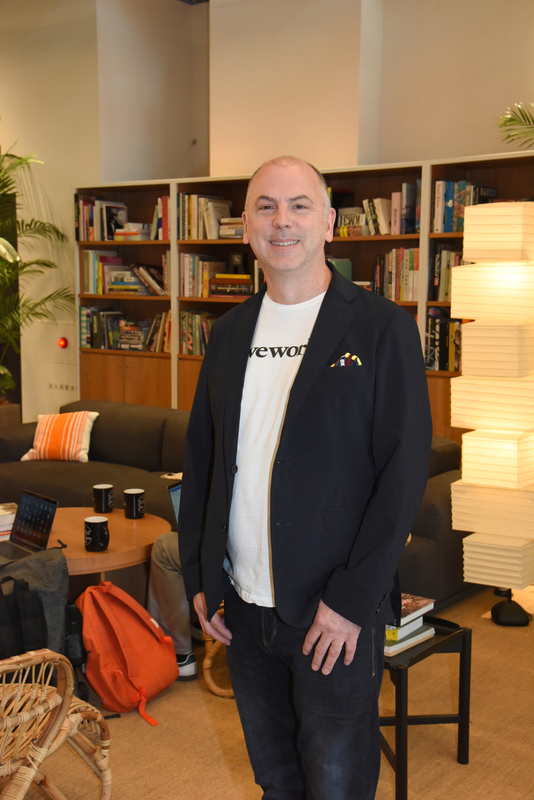 A mix of larger companies — SoftBank, IBM, Fujifilm, Yappli and SmartDrive, among others — using WeWork as office spaces to both improve their working environments and foster inspiration, probably feel that collaboration is also key. “Our partnership with SoftBank is a great example. SoftBank will, in my opinion, with the help of WeWork, lead workplace reformation here in Japan,” said Hill. “They’ve been really forward thinking and moved many people into multiple WeWork locations. In one location where they have a majority, we’re already talking about how we can move some SoftBank people so we can get a better mix of enterprise and local and smaller tenants. They see the benefits. … They’ve been great partners in many ways, but I think the best way SoftBank has been a partner is that they actually are living our mission,” Hill said, smiling. Possessing “a vast historical knowledge on how the company was built and how it runs,” Hill is well-versed with WeWork’s mission — “Create a world where people work to make a life, not just a living.” He also believes WeWork staff is central to this mission. “One of the things I’m really proud of is that I came here to build a Japanese company. We are 91 percent Japanese. I’ve been able to attract the highest talent in the market from companies like Facebook, Apple, GE, the ex-president of Uber Japan … all top executives who have come to join this mission of changing the work style in Japan. It’s meaningful to everyone that’s on the team. What we’re actually doing is more important than anything else,” Hill said. According to Hill, a need and desire to connect comes into play. WeWork’s offices are designed using proprietary software to spur and even force communication. With entrepreneurs and digitally roaming freelancers playing a very significant role in the WeWork tenant mix, spaces worldwide are similar enough for ease of function and to instill a sense of member familiarity. Japan, however, boasts some individual touches. It is, according to Hill, a mix of global process with local execution. “We’re constantly figuring out different ways to bring people together transparently through the design of our space,” said Hill. “People like to meet in many different ways here. I think (Ginza Six is) the first WeWork space with meeting nooks where you take your shoes off and enter the horigotatsu (low tables above a sunken space). It’s implemented in most of the new layouts. We’re an American brand, but sensitive to doing things locally inside our global branding efforts,” he said. 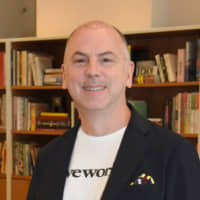 As CEO of WeWork Japan, a subsidiary of WeWork Cos., Chris Hill is responsible for establishing operations, building the Japan-based community and growing the firm’s presence and business in Tokyo and beyond. Hill served as WeWork’s first chief operating officer after it began operations in 2010. His past roles include global head of community and operations, and global chief community officer, where Hill created, implemented and scaled many of the processes, operational frameworks and strategies used to run WeWork communities and create optimal member experiences. Early in his career, Hill launched and grew a chain of small format grocery and provisions markets based in New York, New Jersey and Connecticut tri-state area. Following this, Hill co-founded New York’s first distribution channel exclusively dedicated to organic food, growing sales to over $50 million while at the company. Hill earned his bachelor’s in fine arts in advertising and brand creation from the School of Visual Arts in New York.